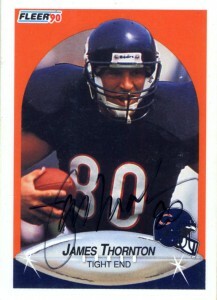 James Thornton was an able bodied tight end with fairly soft hands where his first touchdown catch from Mike Tomzcak was a critical game winner in 1989. A Cal State Fullerton grad in 1988, “Robocop” (as team mates nicknamed him because of his biceps,) was a shrewd 4th rounder during the heyday of Ditka and the Bears. He’d have his best season in 1990 grabbing a career high 24 balls for 392 yards and 3 touchdowns. 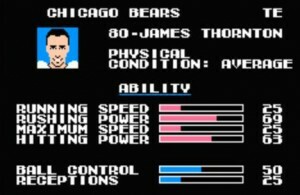 Robocop also averaged well over 14 yards a grab while with the Bears during his 4 seasons there. Greener pastures would call to Thornton and in 1993 and 1994 he’d play for the Jets, before finishing it out with the Oilers in 1995 where I got his autograph on this great Fleer 1990 card at training camp that year.